…if it ain’t got that swing! Hello, Gentle Reader. Both LHR and I have been missing in action for many months. Life gets busy! I’ve been pretty occupied blogging over here recently, and LHR is up to her ears in work and puppy training. BUT, in the meantime, I have also taken up a new pursuit, something I have always wanted to learn to do. Yes, at the ripe old age of (mutter mutter mumble), I have started swing dancing. Seriously, I might be addicted. How I got into swing dancing is a long story, one I promise to share in another post, but you won’t be surprised to learn that it was clothing that got me started. 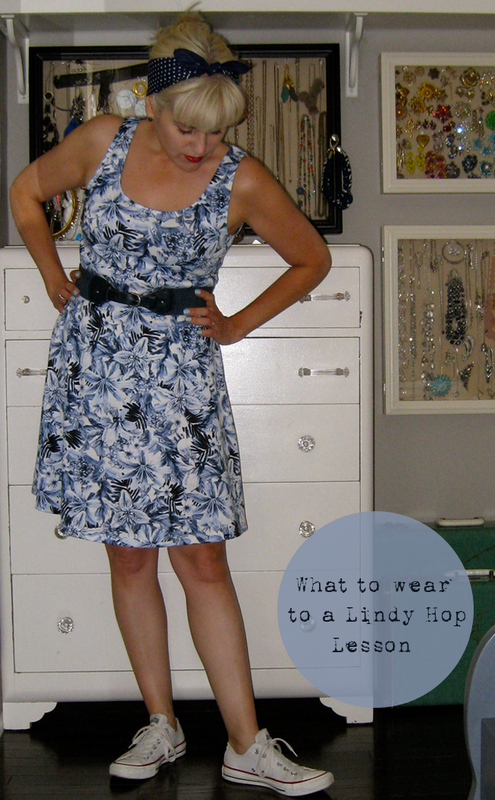 Tonight I am off to my weekly Lindy Hop class with the amazing Natalia and Luis of Lindy Hop Revolution and I am going to trial run a new outfit. Yes, I am keen to learn to dance well, but I’d be lying if I said I do not spend a lot of time planning my swing dancing outfits. dancing that hard is Mighty Sweaty Work. Which means that wearing the kind of original vintage clothing that got me started on this whole journey is simply not an option; you do NOT want to be working up a sweat in a 1940s frock. Nor do you want to expose fragile fabric and seams to vigorous physical activity. 1. I quickly learned that wearing my hair up is critical; it is marginally cooler to keep my hair off the back of my neck. 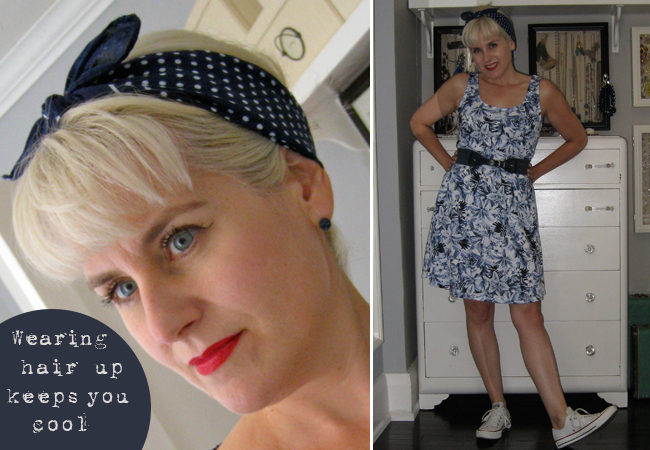 Tonight, I am borrowing a look from Rosie the Riveter— 40s girls wore headscarves to protect their pin-curl sets while they worked. Mine is not a full headscarf because I don’t want to be too warm; I left the top open and just tied the scarf around my usual messy up-do. That way, I get a retro vibe, but don’t have to go to all the work of setting pin curls. 2. I prefer skirts and frocks to trousers– first of all, they twirl nicely and (I hope) can serve to distract from the fact that I am frequently busy making a mess of my footwork or forgetting to listen to the music and losing count… Secondly, as long as one chooses breathable fabric (cotton! ), they are cooler for dancing; I am all about trying to remain ladylike despite being all sweaty. 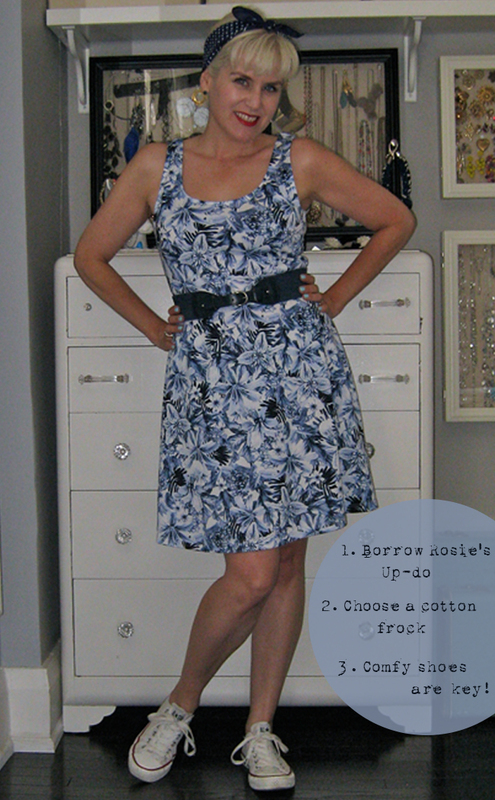 This little frock is a cheapie from H&M– I don’t feel bad about making it work hard. 3. Flats. Yes, I know. I have had to leave my beloved heels on the shelf lately, Interweb. Lindy Hop can be very fast. Heels and learning to dance do not mix. At all. So, I am always on the lookout for cute, flat (ish) shoes that look cute with dresses and skirts. They also need to be comfortable. For this evening’s lesson (for most of my lessons, actually), I opt for my Chucks. They are comfy and they are flat. I’m hoping the hairdo holds up– I have plans to match an outfit to a buddy’s this weekend and I want to wear my hair like this. If it works for class tonight, I know it will work for my weekly Saturday night dance, too!